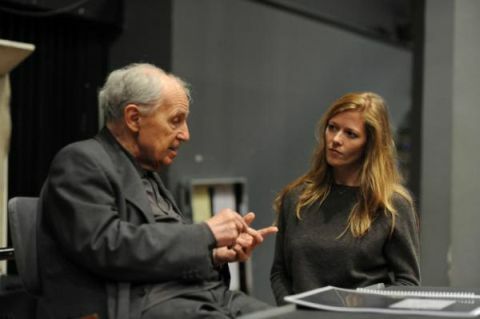 Despite his apparent reputation as a rigorous number-cruncher, as an arch modernist focussed on innovation at the cost of pleasure, Pierre Boulez's music is extremely easy on the ear, at least on twenty-first century ears. A French luxuriance irradiates Boulez's compositions, luxuriance albeit varnished by a sense of the ineffable which glosses the music with a distinctive atmosphere of alienation. The work heard this evening in the culminating concert of the Southbank's Exquisite Labyrinth celebration of Boulez, the late-fifties (though not completed until 1989) 'Portrait de Mallarmé', Pli Selon Pli, is no exception in this regard. The dual sense of sonic luxuriance and emotional alienation detectable in this piece can perhaps be mapped on to the distinction between colour and process that underlies Boulez's conception of music more widely, that is, where tone-colour would be seen to produce luxuriance, and post-serial organisation correlate with the sense of alienation. And yet this opposition seems inadequate, seems too easy; after all, most compositional systems currently in play involve highly personal modes of organisation, which are as likely to produce confusion and perhaps alienation in the listener as Boulez’s are. At the level of audition, in any case, the processual rigour of Boulez's approach dissolves into enchantment of a piece with the sumptuousness of the instrumental writing. The vibrancy of that instrumental writing is key in Pli Selon Pli, although the piece would be nothing without its ambience of languorous portent. Whilst much of its palette has since become rather cliché in the world of modern orchestration, particularly the excessive use of tuned percussion instruments both as doubling instruments for things like flute melodies and in glistening array on their own, the scoring here retains the power to enthral. This is particularly the case with Boulez at the helm as he was tonight; for although he has been reduced somewhat in energy, Boulez’s control over gesture and dynamic is still such that you felt him engaged at the atomic level with Ensemble InterContemporain and the ensemble of the Lucerne Festival Academy's generally glowing, pin-sharp, and dramatic reading. Of especial note in this piece is of course its collapsing of Mallarmé's literary processes, namely his focus on syntax-as-semantics, on language reduced to phonetics (i.e. sound), and on oneiric imagery, into musical ones. Whilst originally a key aspect of Pli Selon Pli was its use of open forms, the definitive version instead captures Mallarmé's freedom and sense of experiment in its almost delirious flow of musical gestures, atmospheres, and forms. Further, Boulez uses Mallarmé’s texts in fragment, in the 'Don' and the 'Tombeau', for example, scoring only one line of the source poems. Boulez's most common technique of ekphrasis here is a transmutation of denotative collapse into sonic efflorescence, a quality captured stunningly by the deliquescing tones of tonight's soloist, Barbara Hannigan. Although at times, for example in the turbulence of the second 'improvisation', Hannigan's tone was found to be a little lacking in fullness, more generally hers was a bravura display, moving adeptly from liquid, semi-permeable figure, to shrill siren, and back again. One of the strengths of Pli Selon Pli is its blending of orchestral textures, although opposition is almost as important. Hannigan's repeated blending with the winds (and particularly the French horn – the closing gestures of the piece are a stunning example) here imbued the performance with a richness matched by the facility of the more local blendings of instrumental colour. These blendings were coolly offset by the force of the sudden sforzandi and the lengthy exploratory instrumental cadenzas which occur throughout. The piece winds its way succulently from haze to clarity and back again, although ultimately it settles on the latter, with the 'Tombeau' clattering along firmly (almost periodically), like a death metal song with its clanging bell repeatedly tolling for the close. Unlike the somewhat compromised Rituel, this clarity feels resolved here, which is perfectly apt given the brilliant obscurantism of much of what has come before. Much standing and ovating followed for Boulez, the firebrand turned conservative elder statesman, who seemed happy enough to receive it.